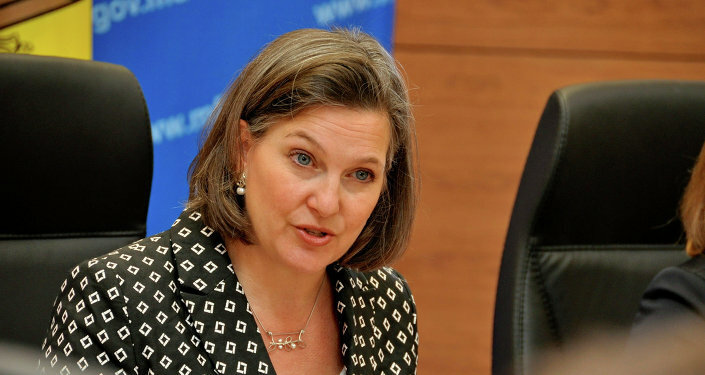 US Assistant Secretary of State Victoria Nuland. US Assistant Secretary of State Victoria Nuland and top Kremlin aide Vladislav Surkov met near the city of Kaliningrad in Russia's exclave bordering European Union members Lithuania and Poland, a source familiar with the situation told AFP. "The meeting is closed to the media. The topic is Ukraine," the source said. The meeting took place in Russia because Surkov is subject to Western sanctions over the Kremlin's role in the Ukraine crisis and is unable to travel to the EU, the source said. US State Department spokesman John Kirby confirmed the meeting, saying Nuland and Surkov had met to discuss "the need for the full implementation of the Minsk agreements," a package of measures agreed by the leaders of France, Germany, Ukraine and Russia in the Belarusian capital last February. "Assistant Secretary Nuland's meeting with presidential advisor Surkov is part of our continued efforts to work with Russia to ensure full implementation of the Minsk agreements, in close coordination with the other Normandy powers —- Ukraine, Germany, and France," Kirby said in a statement. The meeting came after Russian President Vladimir Putin and US President Barack Obama discussed the Ukraine crisis by phone earlier this week. The White House said the Russians needed to "live up to the commitments that they made in Minsk -- to end their support for separatists that are destabilising Ukraine right now." Putin for his part said the Ukrainian authorities must establish "direct dialogue" with separatists in the east and agree constitutional amendments with them. The meeting came amid an apparent international push to shore up the brittle truce amid sporadic fighting in eastern Ukraine. A senior Ukrainian official told AFP that representatives of French President Francois Hollande and German Chancellor Angela Merkel are expected to visit Moscow and Kiev in the coming days to hold talks on the crisis. The negotiations -- to follow Ukrainian President Petro Poroshenko's phone talks with Merkel and Hollande this week -- will touch upon the fragile ceasefire, the completion of the withdrawal of heavy weapons, access for OSCE observers to rebel-controlled territory and the release of prisoners, the Kiev source said. "This is an intensification of efforts that was planned at the end of last year," the source said. Poroshenko on Thursday said he wanted the EU and US to help secure the return of Crimea, annexed by Russia in 2014, and vowed to win back the separatist east this year. Moscow did not immediately confirm the planned meetings. More than 9,100 people have been killed and over 20,000 injured in the conflict in Ukraine since April 2014, according to the United Nations. A series of truce agreements that started in September have helped to reduce the fighting in eastern Ukraine significantly, although sporadic clashes continue on the front line. The West and Kiev have accused Russia of fuelling the separatist insurgency in the east and sending regular troops across the border, claims that Moscow has repeatedly denied.